This CIEH health & safety level 3 qualification provides a thorough understanding of health and safety emphasising the importance of monitoring staff and controls. 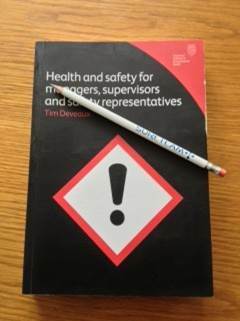 It also details the need for a structured management approach to health and safety and the key factors in implementing health and safety policy. State the potential direct and indirect costs of poor standards of workplace health and safety both to individuals and to the employer. Define the terms ‘hazard’, ‘risk’, ‘control measure’, ‘accident’ and ‘near-miss’. Identify the range of persons who might be affected by workplace hazards. Outline the elements of a managed approach to controlling workplace hazards. Explain the roles of occupational, environmental and human factors in health and safety and how these can be used to structure inspections, investigations and audits. Explain the roles of primary and secondary legislation in health and safety law. State the duties placed on employers, employees and others by the Health and Safety at Work etc. Act 1974 and the Management of Health and Safety at Work Regulations 1999. Explain the legal status and practical application of approved codes of practice, guidance and other publications in assisting employers to fulfil their health and safety duties. Outline the powers of enforcement officers in respect of health and safety. Outline the enforcement actions that might be taken, and the penalties that can be imposed, for breaches of health and safety law. Identify the range of common workplace accidents and link these to human, occupational and environmental factors. Describe the relationship between incidents of varying severity with reference to the ‘accident triangle’ concept. Describe the legal requirements and organisational needs with respect to the reporting and recording of accidents and near-misses. Outline the main principles involved in carrying out an incident investigation. CIEH CIEH Health & Safety Level 3 is currently available as In Business Training at your premises for groups.